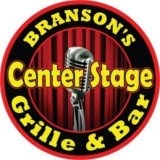 "Branson's Center Stage Grille & Bar" is Branson's premier family eatery with Live Entertainment, where everyone is a friend and most are like family. Homemade food, made from scratch! Awesome menu and Daily Specials that Chef Bill has just created! Delicious 21 day aged steaks grilled to perfection! They offer a variety of music genres performed by aspiring young musicians as well as culmination of tenured entertainers. Great for Lunch, Dinner, or Sunday Brunch.